Say hello to healthy and smooth skin with the natural goodness of Everyuth Naturals. Treating your skin with Everyuth Naturals pack is now rewarding with Rs. 15 PayTm cash. 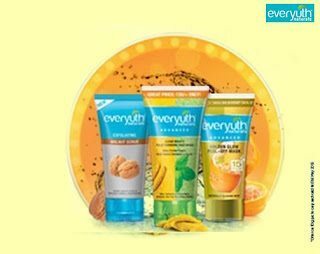 Buy any Everyuth Scrub, Facewash & Peel- Off Mask and get Rs. 15 PayTm credit for free. Offer vaid till 31st May 2016 on select 50g variants of face wash, face scrub and peel-off packs in selected cities only. For redemtion of coupon and t&c visit paytm.com/Everyuth. How to get Rs. 15 PayTm cash by buying Everyuth Pack? Enter your cash code from the product and Click Proceed. Participation in this Promotion namely, Paytm Everyuth Offer (“Offer”) is purely voluntary and optional. This Offer is not valid in conjunction with any other Offer. Products also available without this Offer. By participating in this Offer, each participant is deemed to have accepted these terms and conditions. This Offer is being conducted by Zydus Wellness Sikkim (“Zydus”) in association with One97 Communications Ltd.’s (“One97 or Paytm) (collectively referred to as Organizer) on One97’s platform, namely www.Paytm.com (‘website’), for Products defined hereinafter. On successful application of the Code a onetime addition of respective denomination (Rs 15) to user’s Paytm wallet will be added. Each code is unique and can be used once. A single user account can avail the offer twice.